the Hill Country Youth Event Center. The Hill Country Junior Livestock Show, which has been underway this week at the Hill Country Youth Event Center on Highway 27 past the V. A. Hospital, has a long history in our community. While competitive showing of livestock and agricultural products had its start locally at the West Texas Fair, which was held annually around the turn of the century here in Kerrville, those contests were among adult ranchers and farmers. In 1933, C. F. Freeman, who was the Tivy High School vocational agriculture teacher, organized an exhibit of "fat lambs" in downtown Kerrville on the site where the post office would later be built, at the intersection of Earl Garrett and Main streets. the Houston Fat Stock Show, 1933. "The vocational class has been feeding lambs under the direction of Prof. C. F. Freeman, and Tuesday was the day set for judging as to the winners. "Best Lamb: First Prize, $10, to John Robert Williams; Second Prize, $5, to Jim Grey Freeman. Best pen of two lambs, first prize, two ewe lambs, to John Robert Williams. Largest gain: first prize, 4 lambs, John Robert Williams. Jim Gray Freeman had on exhibition the largest lamb, weighing 121 pounds. "The lambs were shipped by truck Wednesday to Houston, where they will be entered in the Fat Stock who in that city, and will be offered for sale at the close of the stock show. 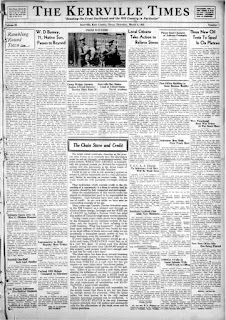 "19 boys, members of the Tivy vocational class, made entries of fed lambs in the local showing were Martin Stehling, Tom Rogers, Jim Grey Freeman, Neil Gillies, Clifton Dickey, Elmer Earl Wren, Henry Allen, John Robert Williams, Rudolph Radeleff, Guy Kincaid, Leo Rodriguez, Leroy Grona, Doyle Nichols, Hollis McDonald, James Spicer, and J. E. Rose." Other members of the class raised pigs; Edward (Happy) Granes started with a pig weighing 80 pounds, and after four months feeding the pig's gross weight was 385 pounds. Gerald Swearingen's pig grew from 80 pounds to a gross weight of 250 pounds. The lambs shipped to Houston had some success there. John Robert Williams won two first prizes, a second, and a third prizes; Jim Grey Freeman a second, third, and fourth prizes; Tom Rogers won a fourth prize. From this beginning, the livestock show grew. 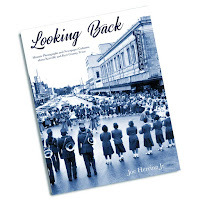 "In 1935," according to an article in the January 16, 1991 edition of the Kerrville Daily Times, "200 supporters attended the show and prize money of $55 was awarded to the winning exhibitors. 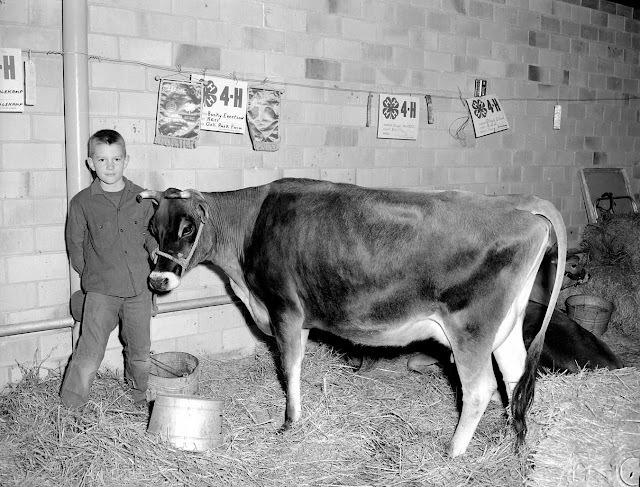 "The Jaycees took over the stock show in 1937. They moved the location to the old Schreiner warehouse, and encouraged even more local support." By 1939, over 2000 spectators watched the exhibition of 250 animals. In 1940 the Greater Kerr County Boys Fat Stock Show was organized, with Pierce Hoggett as chairman. 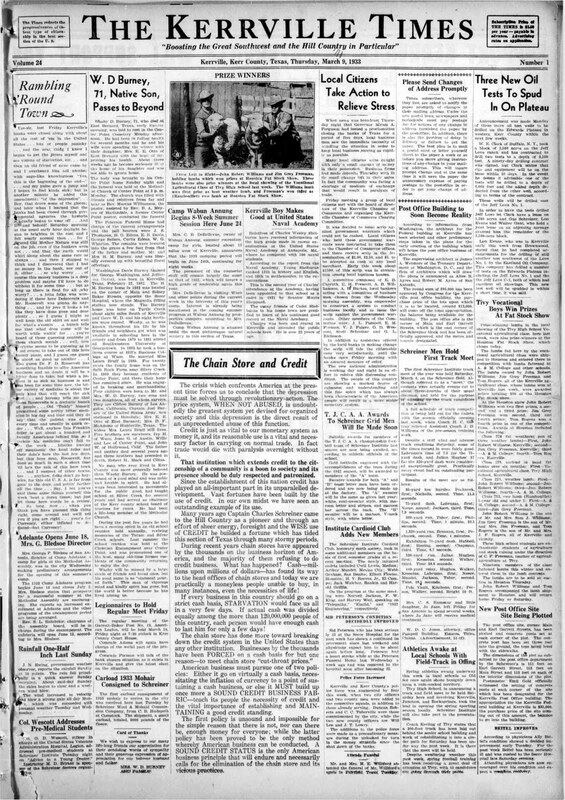 In 1941 a $7,500 livestock pavilion was opened, which was called "a new era in the development of blooded stock in this area" by the Kerrville Mountain Sun. During the war years, from 1942-1944, prize money was paid in war stamps and savings bonds, and many of the buyers donated their animals to the American Red Cross. 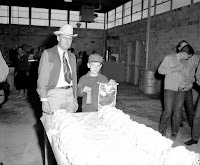 The first Hill Country District Livestock Show and Auction was held in 1945, under the direction of the Kerr County Livestock Show Association, the Kerrville Kiwanis Club, the Kerrville Rotary Club, and both local chambers of commerce. In 1948, 275 boys showed more than 1000 head of stock. In 1953, the Kerr County commissioners court approved a $200,000 bond election to build an agricultural building; in 1954, the commissioners approved the purchase of 90 acres, the present site of the Hill Country Youth Event Center. The first livestock show held on this site was in 1957. Since then the building has seen additions, renovations, and expansion. It's truly a remarkable event center today. This year the Hill Country Junior Livestock Show is celebrating its 75th birthday. Over those 75 years young men and women have learned valuable lessons about hard work, grit, and determination. All of this has been made possible by countless hours of volunteer labor, support from our community, and clear-headed direction by several generations of leaders. Joe Herring Jr. is a Kerrville native who is proud of the success of the Hill Country District Livestock Show. This column originally appeared in the Kerrville Daily Times January 19, 2019.